Naamkaran also known as the naming ceremony or the cradle ceremony is a very popular event in our Indian culture. The new born baby is given a name on this auspicious occasion that he or she will be called as, for the rest of their life. 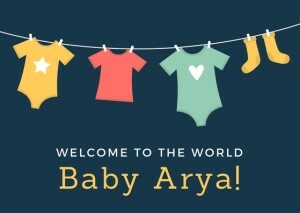 It is a big occasion for the new parents and is celebrated with a lot of enthusiasm and joy. Nowadays, a lot of creative new invites are being sent to invite people over to namakaran ceremony. In this post, you will come across creative and innovative ways of inviting people for the naming ceremony of your little bundle of joy. You will also come across resources where you can buy your requirements directly. Here, is the list of best invitation ideas that are simple yet impressive to invite your guests for this ceremony. Once in a lifetime event of naming your child is a very special celebration and to mark this very special celebration here is a lavender colored half background template to invite your guests in a grand manner. 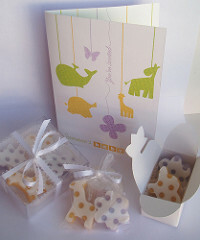 It can be easily customized based on the requirements and can be used for various other occasions like baby shower etc. Firsts in everyone’s life are special so is in your little one’s life. So, doesn’t this very auspicious occasion demands a festive like celebration and this festive like celebration needs a grand invitation. So here is a beautifully carved pink colored baby naming ceremony invitation template with cursive fonts to invite your guests in elegant style. Here is another beautifully designed serene blue baby naming ceremony template with the pink color theme to impress your guests with just one look. This can be easily customized and is easily shareable. These templates can be purchased, customized as per your liking. You can either mail these invites or print them out. Just give the PSD format for the template to your printer and he will do the rest. These kinds of invitation cards work best when you choose to have a private ceremony not involving too many guests and decide on making personalized invites to different groups (eg family name). Getting small amounts of cards printed would ideally be an expensive affair, but we came across a website: Vistaprint that does a fabulous job. Getting 20 cards printed would cost you just around 180 Rs. They offer different levels of customization. One of the more innovative ways of inviting people is to send a recorded invite via a video. This is extremely impressive and people just love the personalized touch it gives you. You and your spouse can come together with your new born to invite people over for this ceremony. You should keep it simple with basic details of venue and time and of course the occasion described in one or two lines. Alternatively, you can also use platforms like Smilebox which we found amazing! 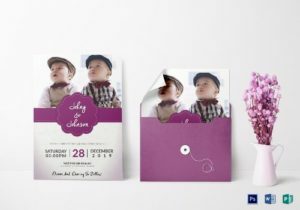 They give you the flexibility to make invites with a collage of photos or use some of their customized themes or a simple video invite. This video could be posted via Facebook messenger to your friends or could be sent on WhatsApp or could be mailed to your friends and family as per the need of the hour. 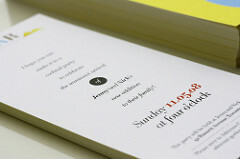 The E-card invites is one of the simplest ways of inviting people to any ceremony. Just google E-Card Invites and you will find numerous websites which offer you free E-Cards. The only issue we found was that they were not as unique as we would like, many of these websites re-used similar templates. And chances are that someone you know might have already used a template you chose. What we found the best was Canva, more complicated than the others but by far the best in making your invite as personal and unique as possible. 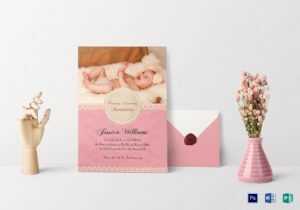 One of the oldest and most traditional ways of inviting people over to naming ceremony is to get these personalized traditional cards printed by a professional. This is still used widely by many due to the Formality it offers. This makes sense when you have a huge event and are inviting a lot of guests. If you don’t have the time to find a professional locally to do these, we’ve found a couple of options online that are great. 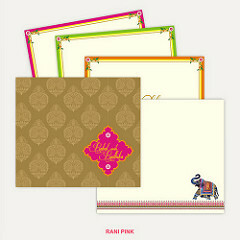 Indianweddingcard provides numerous options with the widest selection we’ve seen. Weddingpaperdivas is not an India site, but they do ship to India depending on the order. Making a personal phone call has a bigger impact that most forms of invitations. The downside is that it is time consuming. This works out fine if the guest list is short. This is one of the most convenient and fastest ways of sending invites. You just need to get your text right and the invites reach in no time. If in case you have a long guest list and you want to send remainders on regular basis you can opt for services like Bulksms. If you want something that is a little more elaborate than just a text message for a smaller guest list, you can try Invitd. They give you features like RSPV, reminders and location. Perfect for when you don’t have too much time and want to know how many of your guests are turning up. 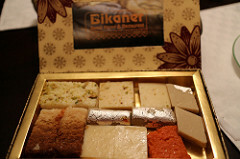 Some people want this occasion to be really memorable and prefer to send invites with some unique gifts. The popular gifts include gold coin, silver coin, gift hampers etc. A 10gram silver coin will ideally start from around 500Rs. We found a website that home delivers these.